Of the 464 colleges and universities on the 50-50 list, 179 of them are public institutions. Furthermore, 50-50 schools are not distributed equally among all of the states. That means that if you want to start your search with the largest number of schools possible, you don’t want to immediately eliminate out-of-state public institutions. For some, the idea of paying out-of-state tuition to attend a university in another state would seem foolish. After all, out-of-state tuition can make public institutions some of the most expensive colleges around. However, the key word is “can.” Those that live in states that participate in tuition exchange/reduction organizations such as the Academic Common Market or the Western Undergraduate Exchange should check the participation requirements. Furthermore, there are plenty of instances where another state’s out-of-state tuition is still significantly lower than private college tuition. For those that may be limited by geography or unable to qualify for substantial merit money, including public institutions with the lowest out-of-state tuition in their search list makes sense. The table below lists show the top 30 most expensive and cheapest public 50-50 schools based on out-of-state tuition according to IPEDS data available in July 2018. A total of 20 50-50 colleges had a total price for out-of-state students of $30,000 or less which is an improvement from the 18 from the previous year. Among public 50-50 schools, 89 are on among the most expensive colleges with an out-of-state cost of $40,000 or more. This 11 more than those based on the 2016-17 tuition data. 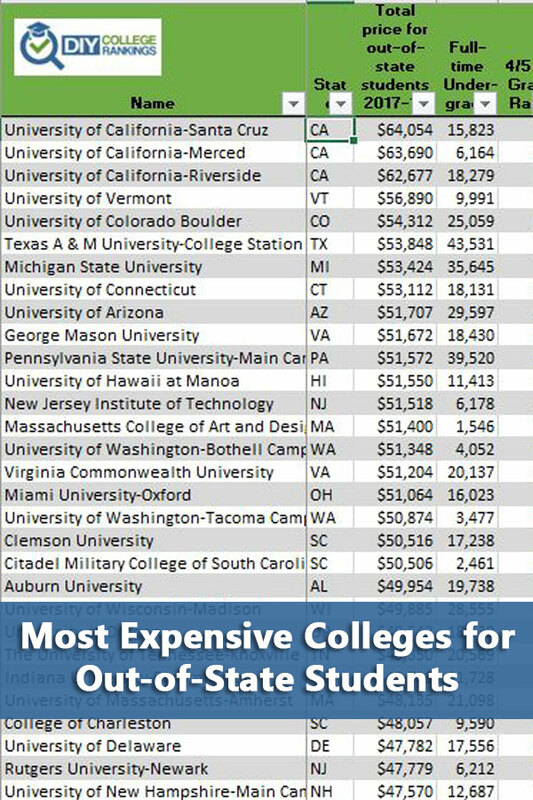 California and South Carolina tied for the most schools on the most expensive colleges list with three each. However, the California schools were by far the most expensive with all three coming in over $60,000 for out-of-state students. The University of Vermont came in second at $56,890 and the University of Colorado was third at $54,312. Wisconsin had the most schools on the cheapest list with 5 followed by Massachusetts with 4. Pennsylvania, Minnesota, and Missouri all had three each. Only ten states had at least one institution that with a total cost of attendance of less than $30,000. Five states had at least one school on each list. In the following table, the five-year graduation is used for public schools. Also beware that average net price is based on students paying in-state tuition.